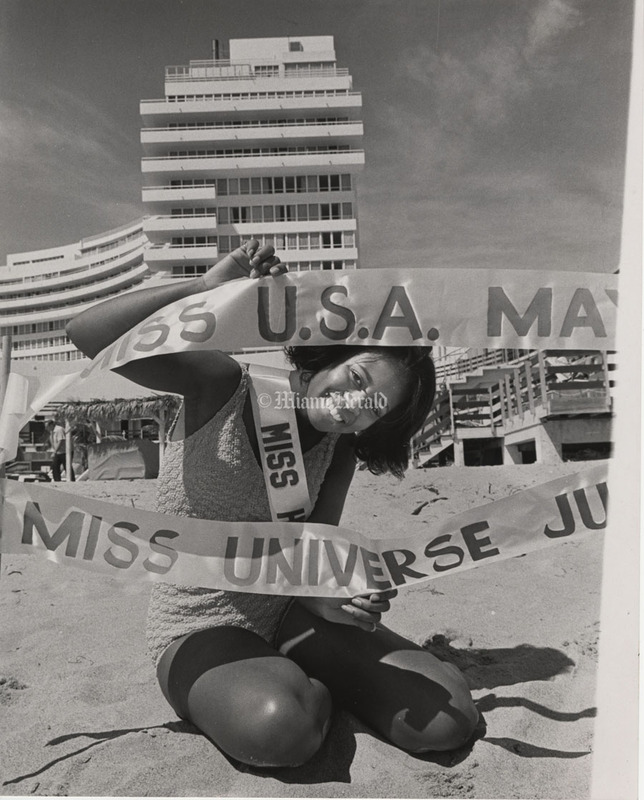 In 1960 Harold Glasser brought the Miss USA pageant to Miami Beach from Long Beach, Calif., where it was born. 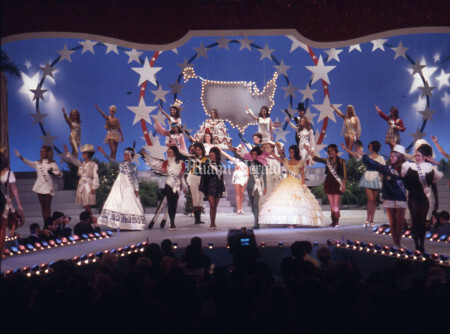 Miss Universe, a spin-off of the original pageant, came along. 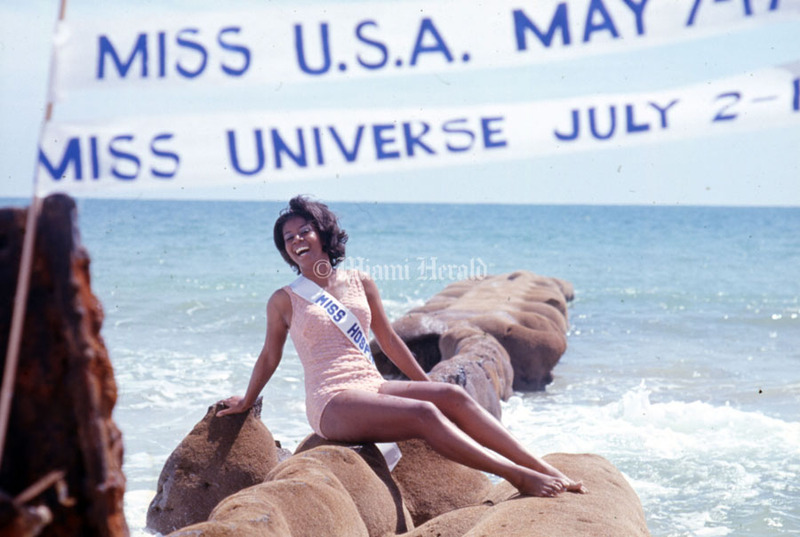 In 1971 the Miss USA and Miss Universe shows left Miami Beach after 11 straight years. While pageants have come and gone since then, for that decade the girls of summer confirmed the notion that the bathing beauty was most at home in South Florida. 5/14/1970, Bob East/Miami Herald Staff -- Miss USA, Wendy Dascomb. 7/17/1969, Albert Coya/Miami Herald Staff -- Wendy Dascomb, Miss USA 1969, during run-up to the 1969 Miss Universe contest in Miami Beach. 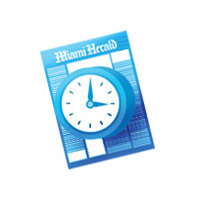 Undated photograph from the archives of The Miami Herald. The photo is retouched by an artist to focus attention on the Miami beauty contestant who would become actress Veronica Lake. 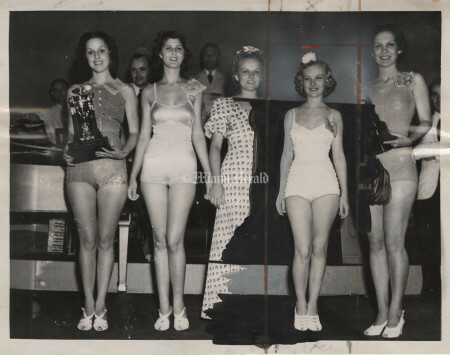 The picture is labelled: "V. Lake 1938 Miss Florida Contest." Lake was born Constance Ockleman and was known by friends in Miami as Connie Keane, Keane being a stepfather's name. 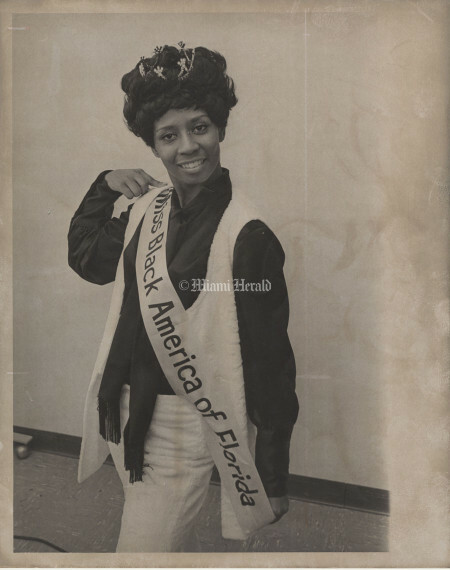 Clippings indicate that she was a contestant for Miss Miami and Miss Florida but did not win either contest (runners-up apparently were eligible to go on to compete at the next level in those years). 3/16/1970, Gus Schuettler/Miami Herald Staff -- Miss USA-Miss Universe Pageants' Miss Hospitality, 1970, Lynda Lockman, 19, poses for the press on the beach of Hotel Fontainebleau in Miami Beach. 7/14/1969, Albert Coya/Miami Herald Staff -- Linda Pepe, Miss Argentina, has a close call with an elephant. Pachy Push: It could be her talent specialty -- a pop dance of sorts -- but the serious expression on Miss Argentina's face shows more than a mild concern for the pachyderm's move. The elephant appears to have developed a new "twist" to the old "Mashed Potatoes." Maybe he just wants to mash toes. Anyway, it all ended happily as the young lady successfully eluded her over-zealous partner at a Miss Universe publicity event in Crandon Park. 7/23/1971, Ralph Pabst/Miami Herald Staff -- Miss Universe beauty pageant. Judge Yousuf Karsh, Canadian portrait photographer. 8/5/1970, Battle Vaughan/Miami Herald Staff -- Miss Universe pageant. Kristina Hanzalova, Miss Czechoslovakia, at Miami Beach. She likes the West, so she'll stay. 7/3/1970, Bill Sanders/Miami Herald Staff -- Miss Universe pageant. Latin Queens. Miss Costa Rica, Miss Bolivia, Miss Chile, Miss Argentina. 5/21/1971, John Pineda/Miami Herald Staff -- Four beauties romp in the sand. Fifty-one of the prettiest girls in the country will appear on the stage of Miami Beach Auditorium, each one trying to outdo the others for the Miss USA crown and the chance to become Miss Universe. The new Miss USA will come back to Miami Beach July 15 to July 25 to compete with girls from around the world for the title of Miss Universe. 5/21/1971, John Pineda/Miami Herald Staff -- Pixie-cute Miss Maine, Ruth McCleery, could win a smile award. Fifty-one of the prettiest girls in the country will appear on the stage of Miami Beach Auditorium trying for the crown of Miss USA. 5/23/1969, Gus Schuettler/Miami Herald Staff -- Three contestants relax before pageant and finals. The 51 Miss USA contestants will take their final sings down the ramp at the Miami Beach Auditorium. The winner becomes the U.S. representative to the Miss Universe contest. Published 5/26/1969: John Walther/Miami Herald Staff -- Breakfast in bed for Miss USA 1969. Wendy Dascomb smiles prettily. 5/26/1969, John Walther/Miami Herald Staff -- Wendy Dascomb, Miss USA 1969, takes a romp in the surf, scepter, crown and all. 5/13/1968, Bill Sanders/Miami Herald Staff -- Little old Rhode Island put its best foot forward in the Miss USA contest's version of "if the shoe doesn't fit, don't wear it." After the formal photo session on Miami Beach was over and the last camera clicked, the gals breathed their pretty sighs of relief -- and Bette Lou Whitmore, Rhode Island hopeful in the prettiness pageant, slipped off her slippers. Undated photograph by John Walther/Miami Herald Staff -- Miss USA contestants on the phone, at the pool. 5/21/1967, Gus Schuettler/Miami Herald Staff -- Miss USA TV show. 5/24/1969, Gus Schuettler/Miami Herald Staff -- Miss USA TV show. 5/11/1970, Joe Schuppe/Miami Herald Staff -- Beauty Southern style is what these five misses offer; they represent Mississippi, Alabama, Georgia, Louisianna and Florida. It's the Miss USA contest and the 51 girls -- each representing one state, plus the District of Columbia -- are each hoping they'll be the one who'll wear the coveted crown. 5/11/1970, Joe Schuppe/Miami Herald Staff -- The countdown's already begun and 51 of the nation's prettiest girls are holding their breath. 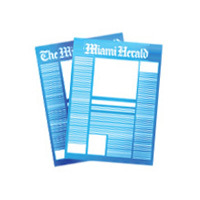 The suspense will end May 16 when the finals of the annual contest are held at Miami Beach Auditorium before a nationwide television audience. 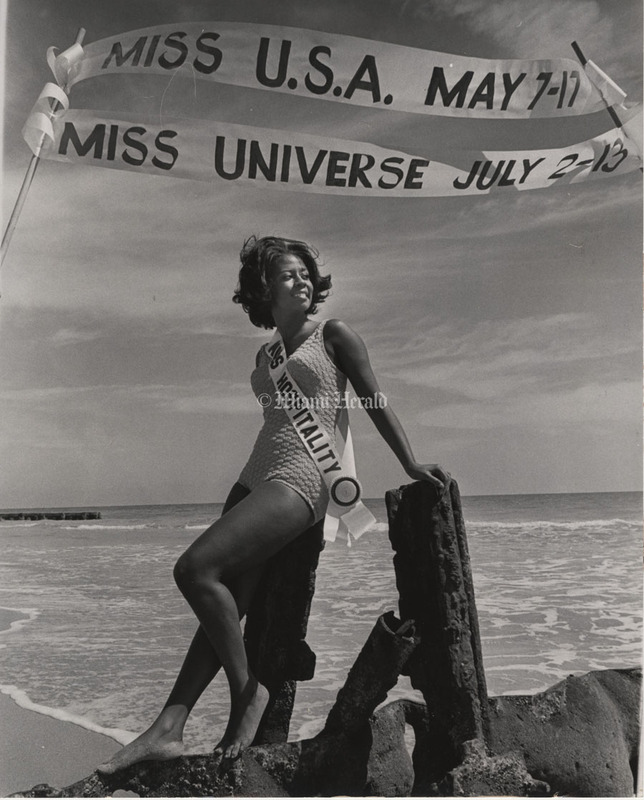 5/11/1970, Joe Schuppe/Miami Herald Staff -- Miss Tennessee gets into the act at Miss USA contest photo opportunity. 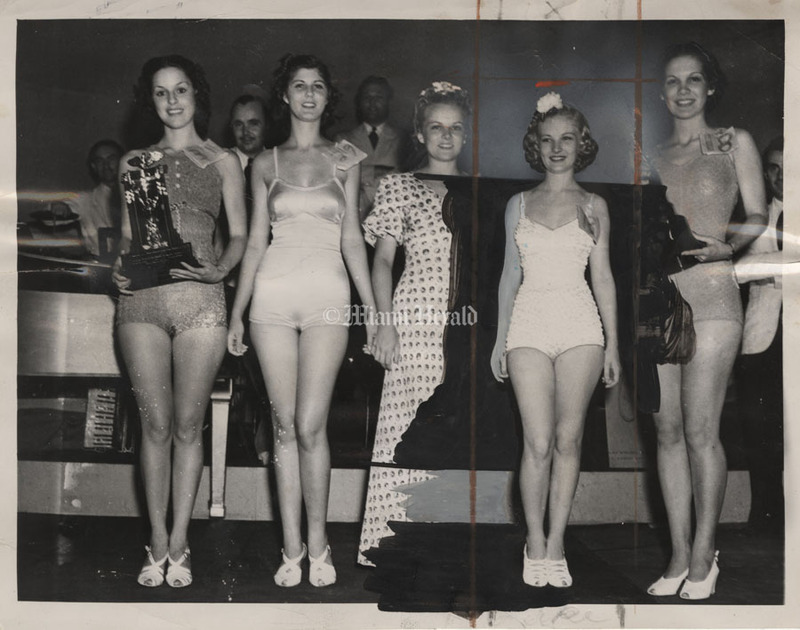 Being photographed are misses South Carolina, Nebraska, West Virginia and Washington. 5/11/1970, Joe Schuppe/Miami Herald Staff -- Miss USA beauty contest photo opportunity at Viscaya mansion. 5/17/1970: Joe Schuppe/Miami Herald Staff -- The morning-after-the-pageant photo opportunity for Miss USA 1970, Debbie Shelton. Although it is supposed to look like spontaneous applause for the beauty queen, the film makes it apparent that Shelton starts over and runs past the men more than once.